A survey found the star was top of the kips ahead of Emeli Sande and Coldplay as the best way to send Britons off to a restful night's sleep. 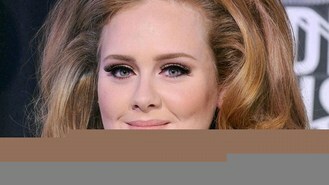 It is the second year running that Adele has topped the poll of 2,500 people for hotel chain Travelodge. The chart-topper also took three out of the top five in a separate list of songs for sending people off to sleep, with her Oscar-winning hit Skyfall at the top, Someone Like You in second place and Chasing Pavements at number four. Sande's Beneath Your Beautiful was third and Coldplay's Fix You was fifth. For the first time Austrian composer Wolfgang Mozart has gained a place in the top five rankings of the kip charts. This year the musician famous for creating a string of operas, concertos, symphonies and sonatas has won fourth place - his music helping modern British adults to fall asleep. New entry into the charts, The Script, an Irish rock band made famous by hits such as The Man Who Can't Be Moved and Breakeven, have won fifth place in the 2013 Kip Charts.